This article details how a user can create a Smart Playlist. Smart Playlists are set up based on specific pre-set criteria (Category and/or Keywords), and the playlist will automatically update when new videos with those criteria are uploaded. This allows users to “set it and forget it.” Create the playlist once, embed it, and never worry about updating it again. 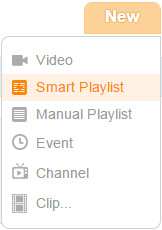 To create a Smart Playlist, click on the orange New button in the upper-right corner Field59 Video Manager. Choose Smart Playlist from the drop-down to open the Create New Smart Playlist screen. Give your playlist a meaningful Title (required) and Description (optional) so it is easy to search/locate later if you need to update it. Next, in the Asset Criteria area, set the criteria for the playlist. These are the rules that determine which videos will show up in the playlist. 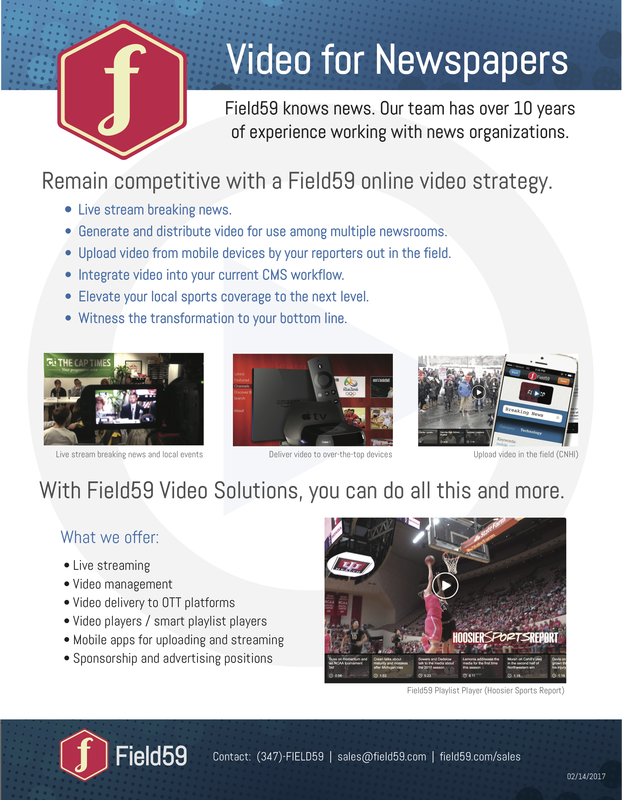 These are the same categories that can be assigned to video assets. This allows you to create a playlist per category. If you select a category from the Category drop-down menu, the smart playlist will only play videos assigned to that category. If you do not select a category, the playlist will be most recent videos regardless of category. Enter keywords into the Keywords field to create a playlist of video assets that have been tagged with any of the entered keywords. The keywords are inclusive rather than exclusive, so keywords “dog” and “cat” will pull videos tagged with either “dog” OR “cat”, not videos tagged with both “dog” AND “cat”. If used in combination with Category, you can limit your playlist to just videos with those keyword and category combinations. A playlist can be from 1-100 items when created in the user interface (developers can extend this via parameters added to the playlist embed code, if desired). A max size of 1 would generate a playlist of a single item, which would just display the newest video asset with your selected category/keyword criteria. There would not be any other videos or scroll bar in the embed code. A playlist with a max size of 10 would show 10 items. New videos bump older videos from the playlist. Once you have selected at least one criterion that has at least one matching video result, you can preview both individual videos, and the entire playlist. The order of the videos in the Smart Playlist is newest to oldest. Mix and match your category, keyword, and max size criteria to achieve the playlist you need. Click the Save button when you are satisfied, and your playlist is created and available for publication.